I hate going to the doctor. Not just a little bit, I dread the whole experience. During my twenties I was horrible about going, I pretty much didn't go other than when I was pregnant. Then I had pneumonia and I go at least twice a year now. However, I still hate it. Growing up my mother had diabetes, high cholesterol, and high blood pressure in addition to being over weight and having horrible anxiety. I have been lucky to have only inherited the horrible anxiety, especially when it comes to doctors. A large part of it stems from having kidney problems growing up and spending a lot of time in the hospital. It made me avoid going to the doctor unless I was sick. Since my mother had so many problems I always have to have a lot of blood tests, which come out normal every time, but I still hate the whole process. Yuck. One way I try to stay healthy is by cooking meals that are either vegetarian or use meat as an ingredient rather than the main part of a meal. My kids have grown to love beans as much as meat, which is a win in my book. Last week I tried a new recipe for Polenta with White-Bean and Roasted-Pepper Ragout from Martha Stewart Living Magazine. This recipe has 10 ingredients. It takes 45 minutes of total time. 30 minutes of which is active, and makes 4 servings. I only made a few changes to the original recipe. First, I used homemade chicken broth, the taste is better and you can control the amount of sodium. Second, I used quick-cooking polenta, I prefer it since it's quick and easy. I doubled the amount of polenta since my family loves polenta. I liked that this recipe was simple and easy to prepare. 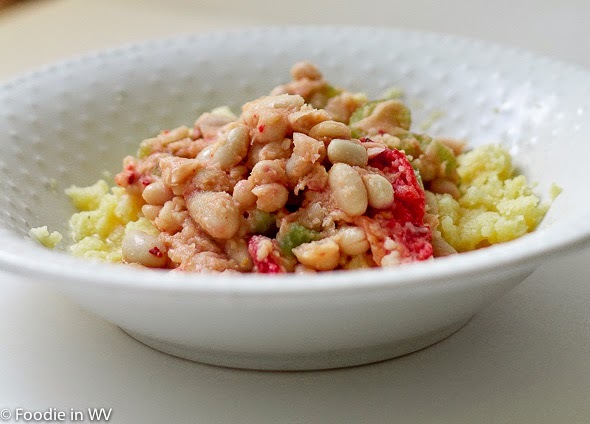 My husband and I enjoyed the combination of the beans and polenta, it was a nice change from having pasta or rice. I wasn't sure what my two boys would think, but they loved the beans and ate their whole servings. This would be a nice summer meal since it's light and doesn't take much time to cook. For the recipe go to Polenta with White Bean and Roasted Red Pepper Ragout. Ann, I have terrible anxiety about doctors. There have been several major situations in my life which have led to complete and utter terror about medical care. My births are the biggest factor and I actually have mild PTSD as a result of those situations, which were truly awful. I can't even talk about it without crying and I get pretty hysterical in the rare case that I muster up the courage to see a doctor. Ugh...it's hard to even write about it. I'm sorry you have so much trouble. I'm always here if you want to talk about it. I just went to the doctor for the first time in years LOL. I hate it, too! I didn't go for a very, very, long time until I got pneumonia. Ever since then I have gone every six months, but I still hate it!!! You are not alone in visiting doctors..and I am the one who will cancel the doctor appointment at the last minute. 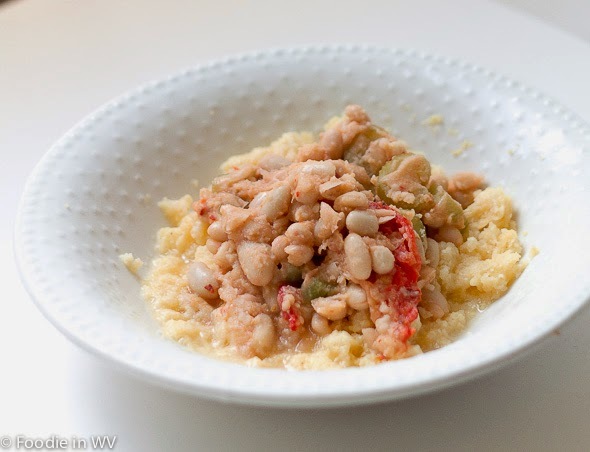 Your polenta with white beans looks very tasty and comforting! I have cancelled at the last minute too :) I always make my kids go though! I avoid them with a passion....the doctors, I mean. However your polenta dish there...I like very much! Glad to know that I'm not alone!! I like beans too. I live in a house full of carnivores, and I cook meat dishes for them daily (hubby won't eat a veggie dish as a meal) but I won't eat it (and I wish I didn't have to cook it, but never mind that ;) ). I don't like dr.'s either, though I make the kids go religiously. I live in a house of carnivores as well. They eat meat three times a day, I only eat a small amount at dinner. I was a vegetarian for a long time before meeting my husband :) I agree about making my kids go to the doctor also. I always make them go, but I hate going myself! I'm not a fan of going to the doctor either. I'm a typical guy, and will only go when I'm really really sick. I like both beans and polenta and have not seen them together that much. Looks tasty! My husband does that too, he waits until he can't move pretty much before going in, men are funny that way! I'm a big fan of beans and polenta too. This recipe is nice since it combines the too and isn't heavy for summer. What is the difference between polenta and grits? There have been many food arguments over that question :) The main difference is that grits are souther, polenta is Italian. They also use different types of corn and the grind is different. You can use stone ground cornmeal for either in recipes though and it works fine.